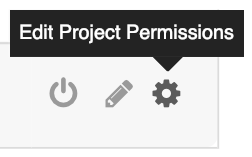 Within Teamwork Projects, you can add observers to specific project on your site. Observers are people on a project that are invisible to anyone in an external company. To make someone an observer, select the People section of your project. Locate the person you wish to make an observer and click the shield icon next to their name. Once a user has been made an observer the shield will display in purple. You can also make someone an observer by selecting the cog icon to the right of the users name in the people area of the project. You can then select Show Advanced and toggle on the Is Just an Observer Here option.